Veteran Mridanga Vidwan Madras A Kannan passed away earlier today. Here is my interview of his from 2010. I met Madras Kannan in January 2010. In the internet age when locating an artiste is just a Google search away, I managed to get his phone number with great difficulty. Ever eschewing the limelight, Kannan was reluctant to meet me when I called. Upon repeated pestering, he finally yielded. When I walked into his apartment at the V.M.Street, he greeted me at the door. Neatly clad in a Silk kurta and a spotless white dhoti , Kannan looked like a man leaving for a concert. My doubts were reinforced when I saw the grand angavastram on his shoulders and several chains, including a Navaratna haram with a Tiger claw pendant, adorning his chest. I had started cursing my luck as I didn’t believe the interview would last for more than ten minutes. Before I could ask him anything, Kannan with a child like astonishment said, “Thambi!, I’m watching interviews in television. The interviewee recounts even the minutest details of the past, as if he is watching his life on a video tape. I’ve always wondered how they are able to do that. I will never be able to do that. It may take several hours for me to recollect incidents in my life. I hope you are in no hurry”. I was relieved to know he was not going anywhere and when I mentioned what went through my mind when he opened the door, he just smiled and said, “I am always dressed like this. My father brought me up this way”. I started the interview with the customary question on his year of birth, he thought for a second and went on a tangential note, “Semmangudi and I were living in the same street at Lloyd’s road. Once I told him that I’ve listened to his concert with Dakshinamurthi Pillai as an accompaniment. He was surprised and asked my age. I replied, “I reveal my age only to my doctor”. But don’t worry, I’ll tell you my age”, he said with a twinkle in his eyes. For a man who was born in 1920, Madras Kannan is supremely young. “Age has caught up with me. I have some difficulty in carrying out some the activities that were easier to do a few years back. But, thanks to the grace of my father and Guru, even today if I sit with Mridangam, my fingers can play what my mind says.” It is indeed not difficult to believe that this man can still maintain his trademark erect back posture while caressing the mridangam, as I’ve seen him do in the YouTube video of T.M.Thiagarajan. Pitambara Desai was a popular guru with expertise in Violin, Veena, Thavil and Nadaswaram, apart from Mridangam. Madras Venu Naicker and Govindasami Naicker, are some of his star disciples. He too was spiritually oriented. He frequently visited Thiruvannamalai and closely interacted with Ramana Maharishi. When Kannan was 8, Pitambara Desai took him to Ramana Maharishi to seek his blessings before arranging for a formal Arangetram. “Tiger Varadachariar sang for my debut. Parur Sundaram Iyer was on the violin and my guru accompanied me on the Mridangam. Immediately after my debut, my guru took sanyasa.” recalls Madras Kannan. Kannan’s father was worried as he had dreamt of a career in music for his son. Like many connoisseurs of his generation, he too literally worshipped Ariyakudi and Dakshinamurthi Pillai and would meet them whenever they came to Chennai for a performance. After Pitambara Desai’s renouncement, Adhimoolam approached Dakshinamurthi Pillai and sought his guidance. Dakshinamurthi Pillai promised to take care of Kannan’s future and within a few months arranged for Kannan’s learning under Thanjavur Ramadas Rao. Kannan quit his school education during the years of his Gurukulavasam in Thanjavur. Later, upon coming back to Chennai, he joined the Hindu high School, Triplicane. In the same year, Kannan accompanied Dwaram Venkatasami Naidu at Allahabad in the All India Music Conference. Dwaram presented him with a gold medal as a token of appreciation. Master Kannan had finally arrived. 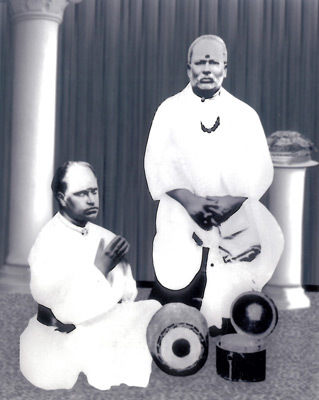 Earlier, in 1932, Kannan was invited to Mysore to perform at the Dussera festival. He had accompanied hHrikesanallur Muthiah Bhagavathar, Gottuvadyam Narayana iyengar and Veena Subbanna in Mysore. Maharaja of Mysore honored him with a shawl and continued to invite him in the following years too. Even as a teenager he had accompanied the likes of Naina Pillai and was a regular accompaniment of Chitoor Subramania Pillai. “Those who understand the laya intricacies should be able to follow Chitoor’s singing. But Naina Pillai’s Kanakku can baffle even the well-informed. His complexities were not explicit. Even a person with no knowledge in laya will be able to appreciate his music just for the Raga bhava.” says Kannan. Needless to say that Naina Pillai’s style left a deep impact on Kannan’s playing. Experts opine that the very attribute that Kannan described beautifully about Naina Pillai has been his hallmark too. Even before the arrival of Arrival of All India radio, Madras Kannan had provided several performances for the Madras Corporation Radio. in 1943, Madras Kannan joined All India radio as Staff Artist, upon insistence of the then Station Director and grandson of legendary Veena Dhanammal, Vijikrishnan. “When they introduced Ragam Tanam Pallavi concerts in the AIR, I was the first one to play in it for Mazavarayanendal Subbarama Bhavathar”, says Kannan. He also has the honor of being the first staff artist of AIR to reach Top Most Grade in AIR. He feels AIR never hindered his career. “I always had enough time to play for my concerts. AIR facilitated interaction with several musicians and resulted in a lot of learning. AIR gave me the opportunity to conceive and produce several programs. I’ve composed many Pallavis for RTP programs”, says Kannan. By the time he was in his twenties he had performed with all the leading artistes including Ariyakudi, Chembai, GNB, Semmangudi, Maharajapruam Viswanatha Iyer. “You can hardly find a concert of Dandapani Desikar without my accompaniment”, says Kannan. Kannan also shared a special relationship with Mali. “Some may feel Mali would get into laya exercises to put the accompanist in a spot. While playing for Mali I have never felt he did anything deliberately to trouble me. He was playing according to his creativity. I had accompanied him from a very young age, so it was never difficult to play with him.”, recalls Kannan. In a Career spanning well over 80 years, several honors have adorned Madras Kannan. In 1955, the then Tamilnadu Chief Minister awarded him the title ‘Laya Ratnakara’. in 1959, Swami Sivananda Saraswati conferred the title ‘Mridanga Samrat’. He nominated by the Government of India to be a part of cultural delegation for a three month long Concert tour of Africa. Emperor of Ethiopia and the president of Liberia honored the team with gold medals. In 1974, the legendary violinist and the then President of the International Music Council had invited Emani Sankara Sastri and Madras Kannan to perform at the Silver Jubilee celebrations of the council. Their performance was voted as “The Concert of the Century”. 1978, the council voted Kannan for the ‘Asian Music Rostrum Award’ at the international selection committee held at Alma-Ata U.S.S.R.
“Palghat Mani Iyer had read about this award in the newspaper. He immediately paid a visit to my house and congratulated me. I consider this as the greatest honor bestowed upon me.”, says Kannan. Grand receptions and felicitation functions were held in Chennai upon Kanann’s arrival after receiving the award. The station director of All India Radio made a special request to conduct an ensemble. Kannan conceived an ensemble, ‘Bhu Kailasa Vadya Sangamam”, depicting the dance of Shiva Parvati. The ensemble consisted of several instruments including some of the western instruments. This program was a big hit and is being telecast on several occasions over the years. While he has won several awards, there have some notable omissions too. The Sangeet Natak Academy Award eventually reached him only in 2004. When asked if it had to do anything with his Non-Brahmin roots, Kannan vehemently refuses. “Dakshinamurthi Pillai was not a Brahmin. But he has won the greatest of honor that any human being can achieve. His disciples have built a samadhi temple for him in Pudukottai and he is being worshipped as God. Can any award equal this honor?”, asks Kannan. By nature, Kannan is not the one to project himself and is happy just take what comes along his way. When asked whether he will be a satisfied man when he looks back at his life, he says, “I have got much more than what I deserve. Whatever I have today, is only because of my father and my Guru. Without their blessings I would be nothing”. In 2002, he completed 75 years in the music field. Sruti Foundation honored him with the Vellore Gopalachariar Award. Several other felicitations followed. Nalli oganized a grand function at the New Woodlands hotel. Karnataka Government honored him for this achievement and awarded him with the title ‘Pancha Nada Kalaratna’. Over the years, Kannan has produced several students who are now spreading his fame all around the globe. Some of the notable ones are Ramakrishnan, Rajan, Srinath, Suresh and Deenadayalan. As we speak, Madras Kannan inadvertently looks at the clock, “oh! I’ve spoken for more than four hours. You must be tired listening to ramblings. Thambi! If you spend even an year with Palghat Mani Iyer he would not spoken this much. Here I am blowing my own trumpet for several hours.”, says Kannan with a blush in his face. As I bid good bye and walked out into reality after a trip down the memory lane, the wonderful fragrance of attar and javvadhu kept following my trail. Several weeks back, I was contacted by Vid. Vrinda Acharya to be a part of a panel in the Swadeshi Indology Conference on Carnatic music. While the topic was not crystallized, from our lengthy discussion (mostly on cultural appropriation of carnatic music), I felt we tended to have more disagreements than agreements. When I expressed that, she said the conference welcomes counter views and they do want to feature all view points. After some deliberation and discussions with some friends, I felt my apprehensions were baseless. After all, I am open for discussion with anyone, doesn’t matter what his/her ideologies are. The conference took place yesterday and here I attempt to record what I heard and add my views on the same. By the time I could finish up my Saturday chores and leave for the conference, I had missed the inauguration and the first few speakers. It was a bad miss for me to miss out on the Nagaswaram recital, which I heard was great. My friends later told me that Mr. Mohandas Pai “roared” and Dr. Sumathi Krishnan from the music academy made a very poignant speech. When I entered the hall, I could only catch the end portions of Mr. Rajiv Malhotra. He mentioned that temples that are maintained by the Archaeological Survey of India, there was no place “to do bhakthi”. He quoted the example of Mamallapuram and further went onto explain how the schemes of “breaking forces” function. In my experience, I have been to several temples maintained by the ASI (examples Thanjavur, Kanchi, Uttaramerur, Darasuram, Gangaikondacholapuram) and these are (in Mr. Rajiv’s definition) living temples. I have no doubt in my mind that but for ASI, the state of these temples would be pathetic. He also mentioned that several of the invitations to be a part of this conference was turned down and congratulated the ones that accepted boldly to participate and complemented them as “Intellectual Kshatriyas”, which brought a smile in my face. This was followed by the keynote address by Dr. Nagaswami. He attempted to trace the history of carnatic music from the vedas till date. The chronology was pretty much in line with what is mentioned in Rangaramanuja Iyengar’s book, History of South Indian Music. He made a very interesting remark on the name “Carnatic”. Since Venkatamakhin’s roots are in Karnataka (Govinda Dikshitar – father of Venkatamakhin – moved from Northern Karnataka to join the Nayaks that ruled Thanjavur). Since the 72 melakartha scheme deviced by Venkatamakhin forms the rockbed of the music system, the system was named as “Karnatak” music to acknowledge his roots in Karnataka. It is widely acknowledged by many that the history of Carnatic music can be viewed as “Music before Sangita Ratnakara” and “music after Sangita Ratnakara”. A similar sentiment was expressed by Dr.Nagaswami as well. In such case, I wonder why we don’t acknowledge the Kashmiri roots of Sarangadeva. I have no expertise to comment on this etymology. I look forward for expert comments on this theory. Finally, Dr. Nagaswamy complemented the bhava rich singing of Vid. T.M.Krishna and appealed that he should be given complete freedom for experimenting. This was followed by the first session of paper presentations. Rebuttal of Allegations” The presentation showcased that the speaker was well versed in Sanskrit. However, there wasn’t enough time on either of the topic that he set out to explain. I felt some of his remarks such as “it is TM Krishna’s horoscope that makes him do what he does” could have been avoided and the speaker might have found more time for the topic on hand. Unlike Syama Sastri, whose conversations with the Goddess were inter-personal or Dikshitar who surrendered as a pandita, Tyagaraja was a social commentator. He saw his life as a part of the smarta network. To his credit, by and large, he has stayed away from what we would find today disturbing, but there are compositions in which misogyny is quite obvious. We could cleanse the meanings, justify them or you could accuse me of imposing post-modern values on to him. But if we, in the 21st century continue to seek cultural validation through his words, we should question them. In compositions like ‘Menu Joochi Mosa Bokave,’ ‘Dudukugala,’ ‘Enta muddo’ and ‘Entha nerchina,’ he follows the classical norm of objectifying women, implying the sexual vulnerability of men. She is always the vice, the seductress who will enslave the man, therefore he needs to be ever watchful. Women and their own self-worth, rarely of any consequence. In ‘Dudukugala,’ it is interesting that the woman is placed below the sudra! And in the same composition, you also find the following casteist reference — “ Despite being born a Brahmin (“Modati Kulam,” first caste), I was behaving like a sudra. Much like Tulsidas, Tyagaraja’s position on women and caste was undoubtedly shaped by his times, his social mores but one wishes that a mind as creative as his had gone beyond or risen above those. TMK says Tyagaraja was misogynist and smartly takes care of the rebuttal by adding that “he was undoubtedly shaped by his times”. It is not just Tyagaraja’s works, there many many works starting from Thirukkural that echo the sentiments expressed by the songs quoted by TMK on women. To expect Tyagaraja to meet TMK’s expectations that are built on values of present times is, to put it mildly, naive. One wishes that a mind as intellectual as TMK’s had gone beyond or risen above this. It is also interesting to not the hashtags Krishna chooses to use for posting this article. His target audiences are clearly not the ones that enamored by the glide towards the thodi gandharam I guess. That being said, Dr. Subramaniam’s rebuttal that Tyagaraja held women in high esteem based on songs that praise Goddess Sita lacks logic. Tyagaraja’s veneration to Sita Devi says nothing about his thoughts on the other ‘vanithulu’ he mentions in his songs. The other contest that Tyagaraja’s lyrics must not been seen with ‘Vakya Artha’ (direct meaning) but with ‘Lakshya Artha’ is nothing but white washing facts to suit one’s own ‘Lakshya’. This was followed by a presentation on Muttuswami Dikshitar by Vidushi Gayatri Girish. She opened the talk warning about the rampant conversion attempts and said it is only through the deep understanding of the culture and tradition one can counter it. She spoke on the composer’ss musical highlights, structure of his compositions, content, unique themes and his open mindedness to appreciate and draw from other systems. She remarked that nottuswara sahithyams show his open mindedness and count for only a very small number of his compositions. seen in a few recent allegations of plagiarism against him. First of all, are there any allegations? Some time after the 17th minute, TMK talks about Dikshitar. If my hearing is right, he doesn’t allege anything against Dikshitar. He actually says, making such an allegation would be ridiculous (as ridiculous as the statement made by Mr. Vijay Krishnan). If there is another source that can corroborate to this “allegation” on Dikshitar, I would like to be educated. This was followed by a talk by Vid, Vrinda Acharya on “Non Translatables in Indian Music.” She lucidly explained how the English equivalents for word such as Nada, Raga, Laya etc are inadequate in explaining the concepts in totality. While I completely understand the challenge in using English equivalents, I struggle to understand how that can lead to cultural appropriation and digestion. I wish she had explained this in detail rather than declared it. The second session started with a paper presentation by Dr. Radha Baskar focusing on Experimentation in carnatic music and tried to analyse ‘how far is too far’. She mentioned that experimentation is important. But it should lead to progression and should not disturb the fundamental ethos. She described the Ariyakudi bhani and asserted that it has stood the test of time. She also mentioned about attempts that deviated from that bani (e.g Vidwan TRS starting with a thillana and ending with a varnam). She explained elaborately on how Tyagaraja’s experimentation lead to progression. She explained the importance of Sahithya and how it forms an important part of our culture. She finally said “Music without words has never been in our culture.” I would like to point out that ‘non sahithya’ music is as much a part of sahithya music in our culture. Especially in the temple nagaswara tradition, where it is mainly raga alapana, mallaris, rakthis and thathakaara pallavi that are played all throughout. To discount the non sahithya elements from the tradition would be denying a rightful place to a rich tradition. This was followed by a very interesting presentation on Role of Patronage by Arvind Brahmakal. I liked his idea that the 10% of the CSR appeals should be dedicated to fostering arts. It was well structured presentation with a clear delineation of the problem and with some recommendations to rasikas, artists, corporate and the government. This was followed by a Panel discussion, which I was part of. I couldn’t take notes as I was in the panel. I write about this from my memory. Dr. Radha Baskar was the moderator. Her first question was directed to Shri. NS Krishnamurthi, a veteran rasika and the ex-director of AIR. It was related to which changes that he perceived were good and which aren’t. His response was mostly around TMK’s attempts to break away from the Ariyakudi format. He remarked that such attempts have not influenced many and there are hardly any takers for it. He opined that the Ariyakudi format was deviced based on logic and had balance in it. The second question was to Dr. T.S.Sathyavathi. She was asked which aspects she held precious in the tradition (there was also some reference to jugalbandi and carnatic rock in the question). She answered it in an interesting way by listing what she found disturbing in the current music scene. She mentioned that the current focus is on high volume, high speed and high pitched singing. She said more things that I don’t readily recall. She concluded, whatever she didn’t list is the precious part of the tradition. Next question was directed to Vid. Melakaveri Balaji. He was once regularly performing with TMK and had gone on record that he wouldn’t perform with him as he doesn’t subscribe to TMK’s ways. It is not clear (to me) if that was related to TMK’s musical experimentation or non music pursuits. He was asked to comment upon this. For which, he said he didn’t feel he had done something great by refusing to perform wth TMK. He felt he just did his duty. As a full time artist, it is not easy to refuse to perform concerts. But he felt his ideals did not match with TMK’s. To be true to his lineage, he felt he should not perform with this artist. His remarks were matter of fact and did not hold any grudge or bitterness. Fourth question was directed to me. It was related to challenges faced by the nagaswaram today and what is the impact of instruments such as saxophone and mandolin coming in. One thing I touched upon that is not part of the article is, how established nagaswaram and thavil artists are treated today. While we say, Nagaswara is a mangala vadhyam and is part of all auspicious occasions, do we know how many times the artists are asked rudely to stop abruptly? The nagaswaram artist also has a paddathi to be followed during a wedding and the reality is they are often hindered to execute it. I witnessed it as recent as a few weeks ago. In the sabha concerts, mostly nagaswaram recitals are restricted to opening ceremonies. Last December, I attended a concert at Sri Parthasarathi Swami Sabha that featured the legendary Mannargudi Vasudevan. The concert was scheduled for two hours. Every ten minutes saw a dignitary arrive and was followed by a rush of a team representing the Sabha to receive the dignitary and make sure he felt comfortable. In the process, they kept blocking the view to the stage and were often found speaking loudly and disturbing the concert. At one of point of time, the stage was completely invisible and there was an extended selfie session right in front of the stage. Would the people involved behave this way if it were not a nagaswaram concert? Another incident from last December hurt me deeply when the nagaswaram artist involved mentioned it to me. During the Music academy concerts, before the inauguration and the sadas, a one hour slot is given to nagaswaram. If you had attended concerts at the academy you would notice that there is a small pedestal over the stage on which the artists sit and perform. This is the case of all concerts except for the two I mentioned above. The above picture clearly shows that the artists do not sit on the pedestal but on the floor. one might argue that it was just a question of convenience. It can save a few minutes by not having to remove the pedestal before the inauguration function. There are no casteist intentions behind this. While I agree that this may have just a matter of logistic convenience, one would expect that we are sensitive to what the artists involved think about. Before you ask me, why am I making an issue out of this when the artists themselves have no problem in performing this way, please be assured that I spoke to the artists about this and they are indeed hurt. It is just not in their nature to protest. That doesn’t give us the license to treat them the way we want. There was a comment in the panel that it is the advent of Saxophone that has caused the downfall of nagaswaram. I refuted it immediately. It is not as if hundreds of Saxophone artists have come into the field. Just one popular artist cannot displace hundreds of traditional players. I was mostly a silent observer for the reminder of the panel discussion. A lot of emphasis was done on the importance of sahithyam and how sahithyam is not just a placeholder. My views are completely in agreement with what the panel said. There is no need to feel ashamed that the roots of the carnatic music are steeped in bhakthi. To say sahithya’s are replaceable with any words and it is only the music that matters is definitely in my view a flawed perspective with an urge to replace the idealogy of the composer with one’s own idealogy. In some some ways, that can be called as misappropriation as well. In the same vein, any attempt to distort the intention of the composer must be censured as well. The outrage cannot be selective. The above video is a live streaming of an event on World Music Day in 2014. This was after our PM Shri. Narendra Modi came to power. Some portions of the program was on a special “theme”. The theme was “Modi”. The compositions that had the word “modi” were rendered as part of the theme. The divine compositions of saintly composers like Tyagaraja was force fit to fit this theme. I would have loved to know if the panel things if this is misappropriation as well. No points for guessing who protested and wrote about this incident. TMK carefully doesn’t take any names and thereby doesn’t bring out the fact that it was two of his students who rendered the third song (The article says first song is by a prominent music, the second by “another musican” and no mention of musicians in the third song) in this “theme”. For each their own politics I guess! The panel discussion was followed by three more presentations. First one was by Jatayu on the Christian Appropriation of Carnatic Kritis. He spoke elaborately quoting examples from Vedanayaka Sastriar’s compositions on how he uses kritis to demean Hindu religious practices and how he uses Hindu divine terms such as “Om” in a Christian context. The presentation was focused and data driven. He also talked about how in “Karnamrutha Sagaram” Abhraham Pandithar talks extensively about the origin of music from a Christian context elaborately (running over several hundred pages) and underplays the Hindu roots (Sama Veda, natya Sastra etc get a passing mention). He also refuted the recent claim on Tyagaraja’s Sujana Jeevana could have been inspired by Sastriyar’s Parama Pavana. (The biographer of Sastriar clearly says that he didn’t have ability to compose music but was able to write for an existing tune. It is quite obvious whose work was original and who followed it). I wish he had also appealed to the community that they stick to the facts and do not resort to protests based on false propaganda as it happened in the recent case, where no Tyagaraja kriti was appropriated but several artists were threatened and abused for singing a carnatic (original) composition on Jesus. of Brahminical patriarchy?”. I felt most part of her presentation was explaining what was original definition of “Brahmin”. I wonder what that meant in the context of the present day. She listed a bunch of non brahmin artists who made it big in carnatic music. She mentioned that it was with great difficulty she found the caste of the artists listed. It was only the music that mattered and it was only due to the topic of this paper she had to dig into this detail. My suggestion to her is, she should just talk to an average rasika in Mylapore and she can get the details instantly. I’m not trying to suggest that the average rasika is biased and casteist. But to say, that average rasika wouldn’t know of the caste of an artist who had made it big is a little bit too naive. I have not read the book. So I cannot comment on the book or the critique. But I found his presentation structured and fact based. There was no high pitched frenzy or call of boycotting or shutting down TMK. He presented several Illustrations of fallacies and circular logic in the book. He also mentioned that some portions are also directly lifted. I would read this paper when the proceedings are published with interest. Overall, it was an interesting day. As promised, I was allowed to make my points freely. While the focus for most part was on the external threats, there could have been a little bit more focus on introspection as well. Here is an illustration of the Tyagaraja Kriti – Muchata Brahmadulaku – A rare song in praise of Lord Shiva. Inspired by the painting posted earlier, I’m posting a recording of the song depicted in the painting. This is from a concert in Montreal in early eighties. Recording Courtesy: Yessel Narasimhan. My apologies for not posting it everyday, although I have been posting it in FB everyday. Here is another cover from Vanoli, depicting the Sangita Pitamaha Purandaradasa. Rajam’s greatest passion was to learn kritis from various sources. He had the opportunity of learning songs from very authentic sources (Ambi Dikshitar, Gowri Ammal, Madras Lalithangi) and in some cases from the composer himself (Muthiah Bhagavathar, Papanasam Sivan). He stayed true to his patantharam in his renditions but never disrespected other sources and variations. He was critical if a rendition was totally against the idea of the composer (e.g. Nagumomu in Abheri) but in general was not critical of improvising or embellishment with new sangatis. For a long time, I couldn’t find this recording. I found it recently on Facebook through Mr. Subramanian Krishnan. I thank him for sharing this rendition. Another work from 40’s inspired by Bharathi’s verses. Today we present a full fledged RTP in Gowrimanohari from an AIR concert. Here is another rare painting from 1939, when he was still a student. For a long time, I couldn’t locate where this painting was published. A Few days back, Thank to Mr. Aravind Swaminathan, I came to know that this was published in the “Hanuman”. Another recording illustrating why Rajam was considered a genius when it come to handling Vivadhi Ragas. Here I present Rajam’s depiction of Panchalinga Kritis along with his unplugged versions.